How to Contest Your Assessment: NYS Guidelines for contesting an assessment. 1 – Look up property info at this NYS site and print the report. This report format is very useful when presenting your grievance to the board. It includes information needed to determine your grievance. 2 – Print separate reports for your home AND any homes IN YOUR IMMEDIATE AREA that you wish the board to consider. Be sure you’re comparing similar properties. They should be of similar square footage, same style (ranch, colonial, split level), number of bedrooms/baths, similar lot size and within a mile of your home, preferably on the same street or cross street. Bring as many as you can. More is always better. 3 – If you have a recent professional appraisal bring a copy. You must leave the information with the board, so make copies of any info you wish to retain. 4 – The board reviews each case individually at a later date, but cannot accept information after Grievance Day. You will receive a letter within about 30 days with a decision on your request. The Board of Assessment Review hears complaints of property owners on grievance day (the fourth Tuesday in May) and may make adjustments to assessments. The Board of Assessment Review consists of at least three but not more than five members appointed by the Cicero Town Board. The majority of the members cannot be officers and employees of the Town. The Town Assessor may not serve as a Board of Assessment Review member. Real Property Tax Law, Sections 102(3),(4), and 523). See also information on the Assessor’s page. It is the intent and purpose of The Town of Cicero Board of Ethics to strengthen the public’s trust and confidence in government through fair and just procedures that afford all parties due process protection and fair and just resolution of all matters under its jurisdiction. Click here to read about the Board of Ethics as established in the Town Code Book. 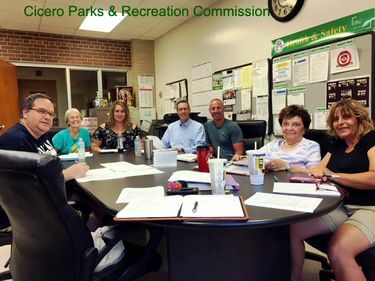 Mission: The Parks and Recreation Commission comprises concerned residents of the Town of Cicero, who are committed to meeting the challenges of providing recreational opportunities and quality park life to the growing Cicero community. The Commission meets on a quarterly basis (or as needed) to act in an advisory role to the Parks and Recreation Department. Duties include, but are not limited to, maintaining fiscal responsibility by assisting in the creation of long range planning and development, and by providing suggestions and community feedback to the Parks and Recreation Department and the Cicero Town Board. It is the responsibility of the Cicero Youth Bureau, Parks and Recreation Department, to administer all new policies. All members of the Commission are community volunteers and are appointed by the Cicero Town Board. The Planning Board is a separate entity within Town Government, advising the Town Board yet also free to make decisions for proposed projects. Members are appointed by the Town Board. The Planning Board seeks to efficiently and effectively promote new businesses within the Town of Cicero while also ensuring that new business structures complement the local area. Before opening a new business in the Town of Cicero, you must first visit the Department of Zoning and Planning and submit the Site Plan Application Form. The form is available from the Forms, Licenses and Permits page , under the “Site Planning and Zoning Forms” section. The applicant will then be scheduled to discuss the proposal. Contact the chair, Mark Marzullo, at [email protected] or 315-382-6150. Current and recent agendas and minutes are here. The Town Board is the legislative and administrative body for the Town of Cicero and comprises the Town Supervisor, the Deputy Supervisor, and four Town Councilors. The Town Board has the authority to adopt local laws, establish Town policies, authorize expenditures, approve the Town Budget and appoint personnel to the Town’s departments and various boards, such as the Planning Board and Zoning Board of Appeals. Town Councilors serve four-year terms and the Town Supervisor serves a two-year term. The Deputy Supervisor is assigned by Town Councilor and has no vote. Meets the second and fourth Wednesday each month at 6:30 PM. The Zoning Board of Appeals (ZBA) is a separate entity within Town Government. Members are appointed by the Town Board. The ZBA seeks to resolve issues for proposed projects that are in violation of the Town Code. This is done by evaluating the proposal against criteria on the ZBA Application and by querying neighbors of the proposed site. If a building permit is denied for code violations the person may appeal the ruling by submitting the Zone Variance Application Form to the Department of Zoning and Planning. The form is available from the Forms, Licenses and Permits page , under the “Site Planning and Zoning Forms” section. The applicant will then be scheduled to discuss the proposal. They will schedule the applicant for an upcoming ZBA meeting (normally the first Monday of a month at 6 PM). There is a non-refundable fee of $200. The process may take several meetings as options are considered and neighbor feedback is assessed. The time frame from submitting the ZBA application form until the first review by the ZBA is generally a minimum of three weeks.